What makes our world different than the world we grew up in is the rate of change in technology. 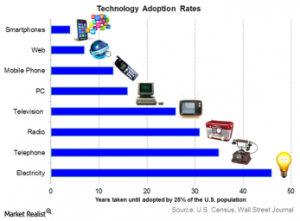 Adoption rates for technology over time, according to the U.S. Census, shows us that it took about 45 years for 25% of Americans to adopt electricity, 35 years for 25% of Americans to adopt the wired telephone, about 32 years for 25% of Americans to adopt radio, 25 years for TV, 15 years for personal computers, 12 years for mobile phones, eight years for the Internet, and about about five years for 25% of Americans to adopt smartphones. Nearly nine in ten Americans today are on the Internet and 77% of Americans now own a smartphone, according to Pew Research. Quite possibly our biggest challenge in the 21st Century is to keep up with the rate of accelerating change. Technology – especially information technology, the basis of our social networks – is speeding up exponentially. The famous Moore’s Law predicted this for computer chip development. Exponential growth rate is an evolutionary process. In his book “The Singularity Is Near” Raymond Kurzweil showed how civilizations advance through building on the ideas and innovations of previous generations, a positive feedback loop of advancement. Each new generation is able to improve upon the innovations of the past with increasing speed. Only 17 years into the 21st Century and it feels like Kurzweil nailed it with his prediction. While it’s true so much of our world is uncontrollably speeding up, we are still human beings and we still pretty much move at the same pace biologically as we always have. Technology doesn’t transform our human nature. Our need for love, touch, companionship and community will always be part of our humanity no matter what technology brings. Great radio makes a human connection, engages its community and is a companion. 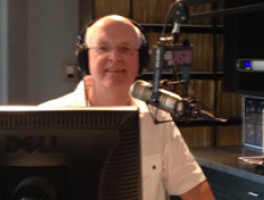 Radio’s best feature in a world of complex technology is that it’s simple to use. It’s that simplicity, I believe, that makes it the #1 media favorite.